This week Kerry's TCTC is a color challenge - So Saffron/Rose Red/Always Artichoke. I added Watercolor paper and Black card stock as my neutrals. 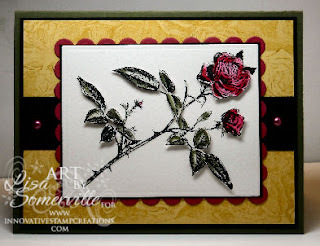 To create my card, I used the Delicate Roses Plate from Innovative Stamp Creations. This plate has a beautiful coordinating background stamp full of beautiful roses! I stamped the background stamp in So Saffron on So Saffron card stock. The rose is stamped in Black Archival then colored using the Marker Watercolor Technique. I stamped and colored the image a second time and popped up some of the images on dimensionals. The rose stamped panel, and the scalloped panel were cut with Nestabilities. Be sure to stop by Kerry's Blog to see what the other members of the Inspiration Team created with this weeks challenge. Wow! I love that technique. It turned out beautifully. This is gorgeous! WOnderful job with the challenge! Beautiful. Wonderful background stamp. Roses are one of my favorite flowers. Love how you layered the rose image. STUNNING card, Lisa! Beautiful take on the challenge! As usual, Lady, you completely blow me away with this! Gorgeous! Another PULCHRITUDINOUS card by Lisa! Exquisite! Classy card...great use of the challenge colors!